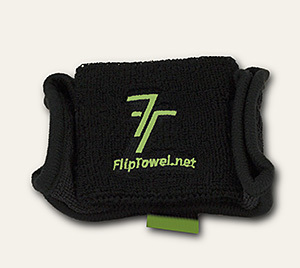 The sweatband portion of the Flip Towel is made of a high-quality microfiber material, ideal for sweat absorption. The sweatband is 3.25 inches in length and 3 inches in height. The towel portion of the Flip Towel is also made of a high-quality microfiber material, which is both soft to the face and ideal for sweat absorption. The towel extends beyond the sweatband approximate 7.25 inches for small and 8.00 inches for long. The Flip Towel (sweatband and towel portion) comes in black. The logo (with matching tab) comes in white, hot pink, florescent green or green. Great to insert company, school, team, or event names, logos, or mottos (minimum order required). Small Flip Towel with pink band. Small Flip Towel with orange band. Large Flip Towel with green band. Large Flip Towel with white band.